Chairman Steven Thompson has every right to lambast the underperforming players at Dundee United, says former Tannadice defender Mark Wilson. However, Wilson thinks the broadside is unlikely to inspire the "miracle run" needed to save them from relegation. Thompson apologised to supporters for "abysmal" performances. "You'd think it would go the opposite way - the chairman saying they've got 13 games to save their professional careers, almost," said Wilson. Thompson's statement said that United squad members have "13 matches to preserve the club's Premiership status and redeem their own professional reputations". 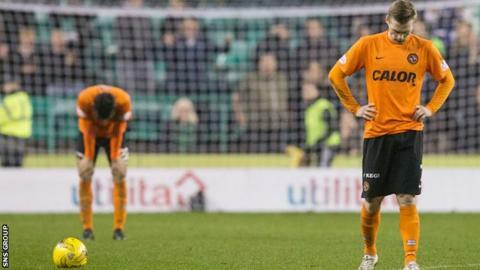 The Tannadice club are 13 points adrift at the foot of the table following Tuesday's 3-0 home defeat to Motherwell. "I would be hurt by it [the statement]," said Wilson, who began his career at United and ended a second spell with them last year. "I think you expect criticism and public criticism, probably from your manager. "But it's slightly strange when it comes from the chairman. However, I'm sure the players are under no illusions of where they are at the minute and what they've done to deserve to be there. "They've got to realise that at a time like this the chairman has every right to come out and criticise them." With just three wins from 25 league games, Thompson talked of "miserable failure on the pitch". "I wouldn't think that's the best way of inspiring a team to go on some sort of miracle run to get them up the table," Wilson told BBC Scotland. "It's different now from when I was there. They were used to relegation battles when I was first there as a kid. "When I went back the second time [in 2013] they were so successful and playing some great football. They'd won the Scottish Cup [in 2010] and we got back to the final [in 2014]; so it's a different support now and they expect success. "That's why the fans are turning. They expect the success and the quality of players like Stuart Armstrong and Nadir Ciftci [both sold to Celtic last year] - and things coming through. "At the minute they're not getting either results or those players coming through. So, they'll be really disappointed. Before long they'll probably start calling for someone's head." Prior to Tuesday's loss, manager Mixu Paatelainen had put together a three-game unbeaten sequence. "A couple of weeks ago I was thinking 'they'll go on this little run now' because teams have gone on a run and got away from United," added Wilson. "I really thought they would go on a run. But after the other night's performance against Motherwell I think that was the last straw and I think they've consigned themselves to life in the Championship next year."